Rabbit anti Bovine, Canine, Equine, Guinea Pig, Human, Mouse, Porcine, Rabbit, Rat, Zebrafish Splicing factor 1 (SF1). 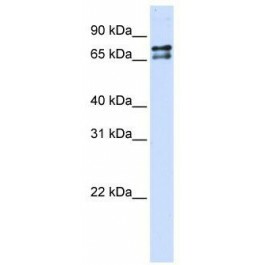 The immunogen for anti-SF1 antibody: synthetic peptide directed towards the N terminal of human SF1. Synthetic peptide located within the following region: ATGANATPLDFPSKKRKRSRWNQDTMEQKTVIPGMPTVIPPGLTREQERA. SF1 contains 1 CCHC-type zinc finger and 1 KH domain. SF1 is Necessary for the ATP-dependent first step of spliceosome assembly. It binds to the intron branch point sequence (BPS) 5'-UACUAAC-3' of the pre-mR. SF1 may act as transcription repressor.